Shredding With Nimble Agility: The new KTM 350 SX-F continues to deliver a dominant mix of horsepower and agility. For 2019, it has gained even more performance and torque, bringing it ever closer to the power of a 450, without losing its 250-like agility. When you're looking for more than one advantage, this powerful, lightweight racer combines all your needs into one dominant package with serious championship pedigree to back it up. Crankshaft: The 350 SX-F's crankshaft utilizes a short connecting rod, which makes for an overall compact and lightweight engine with a snappy power delivery. A plain big-end bearing with two force-fitted bearing shells runs directly on the crank pin. This design is a major prerequisite for the extremely high engine speeds and the unrivaled maximum power of the 350cc engine. Not only that, it also enhances the engine's durability, allowing long crankshaft service intervals - a customer benefit in respect of time, effort and cost. 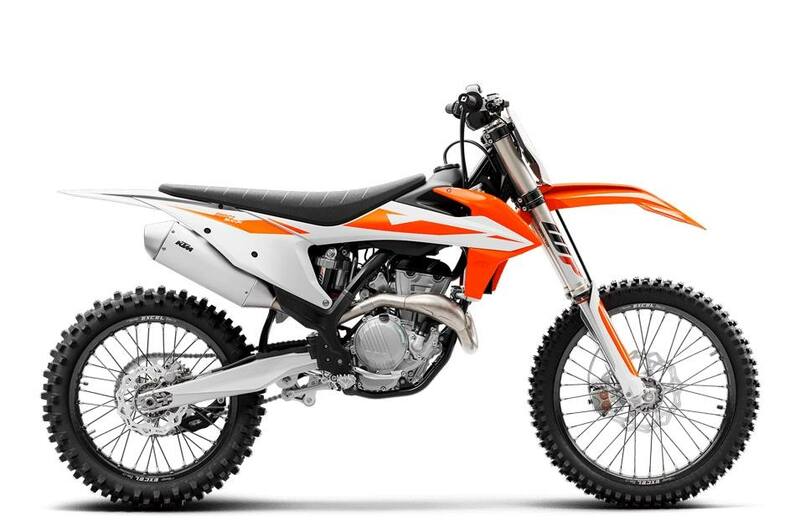 E-Starter: Like all KTM 4-stroke motorcycles, the 350 SX-F is started at the push of a button - a priceless advantage when you're on the clock.